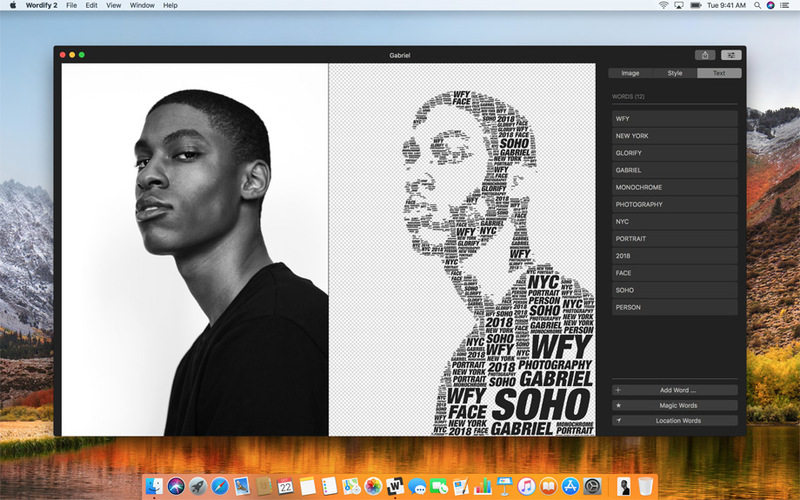 Turn images into beautiful typographic artwork. Redesigned from the ground up, the all-new Wordify 2 is now smarter, faster, easier and more Mac than ever before. Through automatic image optimization, machine learning, computer vision and reverse geocoding Wordify 2 is wicked smart. Images you provide to Wordify 2 are instantly preprocessed to achieve the best possible results for Wordification. Run out of words? No worries — Using a custom trained machine learning model and advanced computer vision technology Wordify 2 can automatically infer suitable words from over 6.000 classes on your input image. We love this feature so much that we gave it a pretty bold name: Magic Words. If your images contain GPS information from your camera or iPhone, Wordify 2 can also use these to suggest words based on the image's location. Now — that's what we call smart. Leveraging macOS High Sierra and its advanced Metal graphics pipeline, Wordify 2 now performs all your commands in realtime. Changing image adjustments, colors, fonts or adding words – it’s just instant. When we designed the original Wordify five years ago we envisioned an app that could perform Wordification in realtime. Today — we can do just that. Everything you do in Wordify 2 is realtime and instantaneous. This is why you also get a beautifully rendered WYSIWYG preview of your artwork right within Wordify 2. All this is made possible by using the latest and the greatest graphics technologies on your Mac. Wordify 2 requires macOS High Sierra and a Metal-compatible Mac to run. Wordify 2’s all-new streamlined User Interface is super easy to use, it's beautiful and it lets you work efficiently and fast. We have always designed Wordify with simplicity in mind. Wordify 2 builds on that legacy and sports an entirely new user interface that is streamlined & powerful. Its dark single-window appearance is not just beautiful to look at but helps you focussing on your artwork and images. Wordify 2 supports Full-Screen, Split-Screen, Undo/Redo, intuitive keyboard shortcuts, cut, copy & paste and much more helping you work fast and being creative. 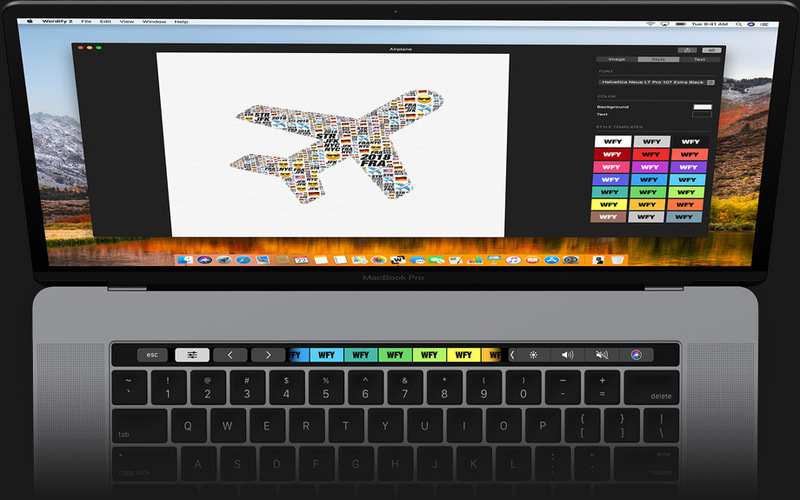 On compatible MacBook Pro models Wordify 2 provides you with great TouchBar support, too. Easy. 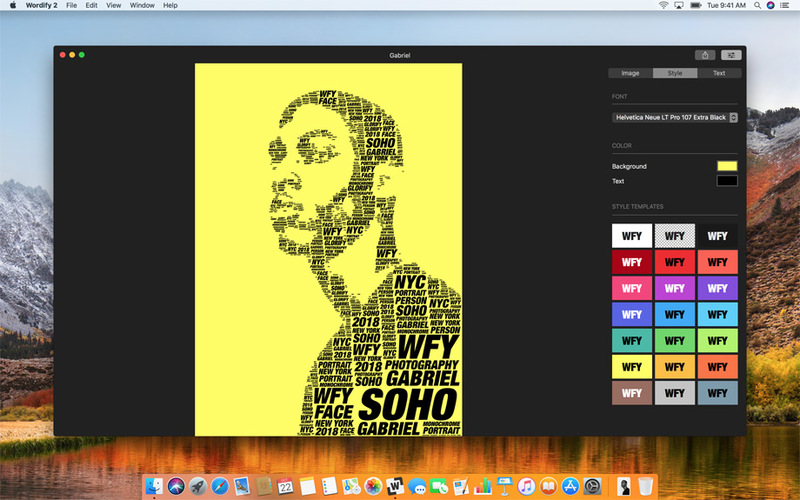 Wordify 2 has been designed to deliver a true Mac experience. 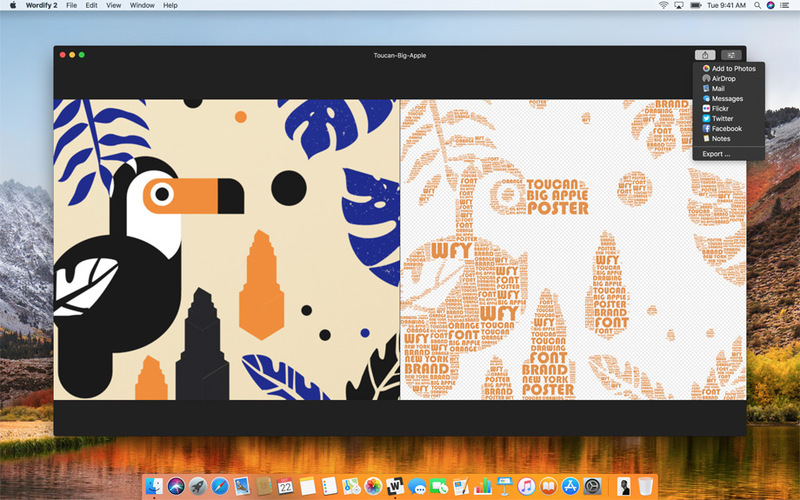 Made for macOS High Sierra it features everything you expect from a first-class app on your Mac. We love the Mac. So naturally we wanted Wordify 2 to be a first-class Mac citizen. 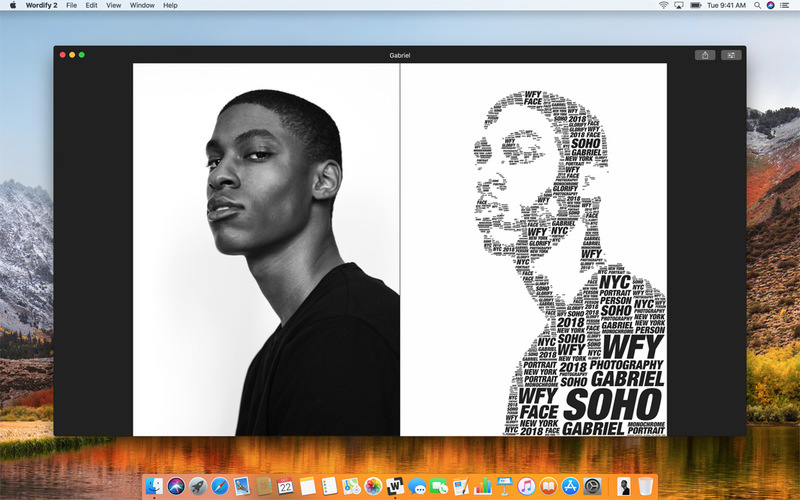 By leveraging many modern Mac technologies for an entirely native experience, Wordify 2 is right at home on your Mac. Support of AirDrop, Sharing, Drag & Drop, FaceTime camera capture and so much more make it feel instantly familiar. Wordify 2 plays nicely with iOS, too. Not only can you wirelessly AirDrop images back & forth between your devices, but Wordify 2 also supports Portrait Mode Photos taken on modern iPhones to mask out unwanted backgrounds in your portrait shots. Wordify 2 is available exclusively on the Mac App Store.